The recording DVR is hidden and built into the wall outlet plug. Once in place, you can set it to motion activation or use the remote control to turn the video camera recording system on and off. 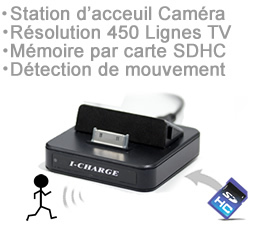 Since the built in covert hidden camera records to a Micro SD card inside the DVR, you can quickly remove the card with the evidence and leave the unit in place for black ops covert video operations as you review evidence and continue the investigation. This is covert video at it's best giving you law enforcement grade dependable and rugged equipment. The tiny iCharger covert hidden camera hides in plain sight right out in the open and no one would ever suspect that the very product they are plugging their iPhone, iPad or iPod into is covertly video recording everything around it. With motion activation and time/date stamping, it's the perfect covert video recording system for anyone who has an iPhone, iPad or iPod! 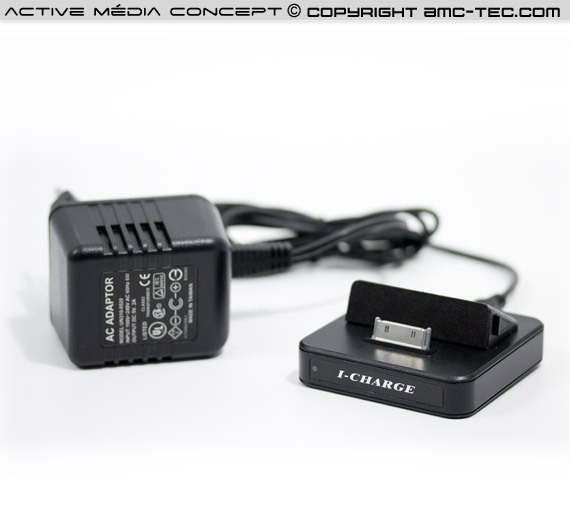 Since this high grade covert video recording system is powered by the wall outlet plug, there is no limitations on time nor battery power to worry about. 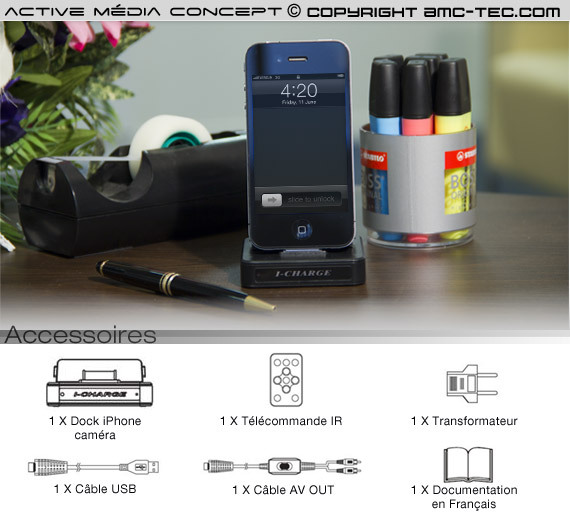 Tiny, simple ingenious and a covert video power pack studio is the only was to describe this. 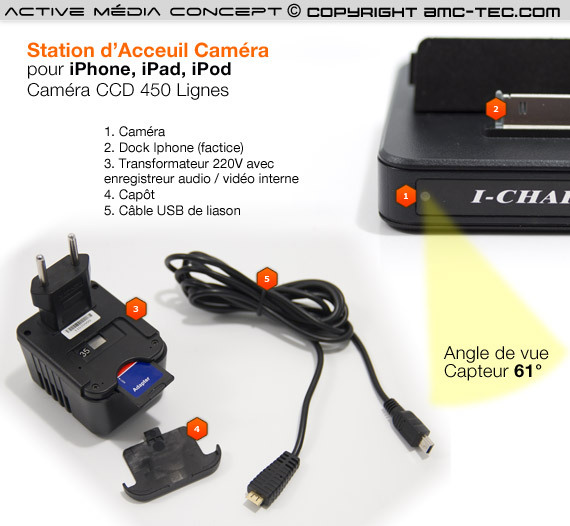 The new iCharger is a gift that can keep on giving you the covert video evidence you need! The iCharge is really really small! 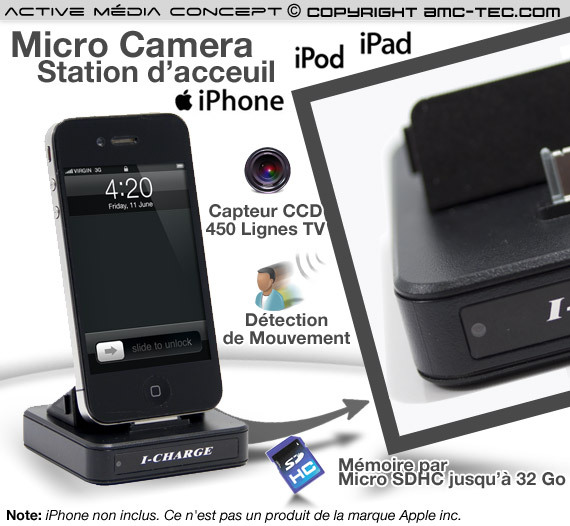 In fact, the iCharge stand itself is a mere 2.5 inches X 2.5 inches by .05 of an inch deep! Gone are the days of needing an old style bulky self contained video camera with DVR systems such as air purifiers and large clock radios is now dead!